Who cares about winning? In this game, you try not to be the loser! 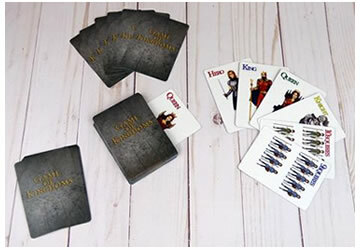 Game Of Kingdoms is a fast paced card game that everyone can join in on playing. Games don't take long and learning how to play is a breeze. Simply match card colors and make sure you play a card that is higher than your opponent. See the complete game rules for more details. Game Of Kingdoms is a portable game that you can take just about anywhere and quick enough that you can slip in a game almost anytime. Great for two to six players. You'll have a good time playing this card game. Give Game Of Kingdoms a try today. Review Completed (2018-09-18) Right on the front of the game box we received was the printed phrase "Do not lose." We thought that was a little strange to instruct people to not lose your game. Then we realized that was the object of the game – to not lose. Now we get it. 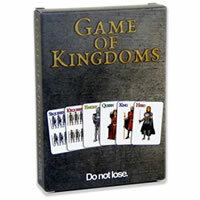 Game Of Kingdoms plays like other face card games where you’ll need to put down a higher card to win. The game rules are similar but have a few twists and turns in it including the fact that you’ll get all the cards if the Defender does not successfully beat all of the Attackers cards. While the game was fun, we wouldn’t say it’s the most fun card game we’ve ever played. It’s a good past time to play if you want something different and quick. There is a bit of strategy although sometimes the person that looks like they will lose ends up not losing in the end. Sometimes what you had in the earlier part of the game didn’t really matter and all came down to your last hand. The graphics on the cards were OK but very plain. Perhaps this is by design but we found them a bit boring. They served their purpose, but they wouldn’t win any awards in the graphic design department. The cards are also not symmetric so you’re constantly turning the cards around in your hand. Built from decent quality cards, a nice tuck box and a fairly entertaining gaming experience, we’d recommend this game if you were looking for something new and simple to play. The price point seems about right, although you can get the main stream card games from your big box stores for much less. Honestly, you could play this game with regular face cards. The knight theme makes the gaming experience a little more dramatic and makes it feel not like just another face card game. Maybe enhanced graphics and a few more unique aspects to the game play would help boost the game up. Regardless of a few nit-picky things which are solely our opinion, it's a fun game. You're trying to not be left with cards when everyone else is out. 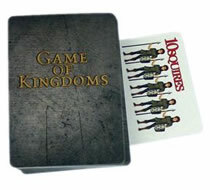 This game comes with 40 cards and the official Game Of Kingdoms game rules and instructions. Please keep in mind that the official Game Of Kingdoms dice-card rules and instructions could be different depending on the game version you have. The rules below are some of the exact directions on how to play Game Of Kingdoms. Share with us your comments, funny stories, tips, advice, strategies, creative ways to play, questions about how to play, problems with the rules or anything you want about Game Of Kingdoms. All submissions will be reviewed within 24 hours. Click here to add your Game Of Kingdoms comments.